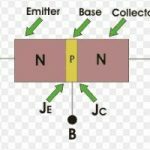 Inside the battery, from the negative terminal to the positive terminal of the battery, then, the battery, the energy is supplied to the charges the work is done on the charges. Hence there is again in the energy associated with the charges. Thus there is a rise in the potential of the charges. So there are a voltages fall or voltages drop from positive to the negative terminal of the battery. These directions of the rise and fall of potential across the battery are independent of the directions of the current through the battery. they purely depend on the polarities of the battery. 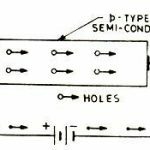 From the positively terminal to the negative terminal of the battery i.e from A to B, through the wire, the work is done by the charges and the energy is lost by them in overcoming the oppositions (resistances R) of the wire. 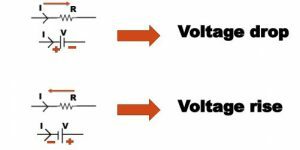 So the charges loss their energy i.e there is a decrease in the potential of the charges from A to B . so there is a voltage drop from A and B in the directions of the directions of the current through the wire. conversely, there is a voltage rise from A and B in the directions opposite to the current through the wire.